I wrote some thoughts on China, Apple…and your company that were published in the Nikkei Asian Review. The published version is here. Where is your red line, the point beyond which you are not prepared to go? If you are doing business in China and you have not had that discussion with your chief executive and your board, your company is playing with fire — and with its reputation, bottom line and future. Where you draw the line is important. It is also important to be able to explain your decision logically, ethically, morally and economically. For Apple, withdrawing virtual private networking apps at Beijing’s demand from its Chinese iTunes App Store was clearly not over its red line and was explainable in legalistic terms. Chinese internet users utilize VPN apps to evade the country’s infamous Great Fire Wall and evade online censorship with a high degree of anonymity. In late July, Apple told providers of VPN apps that they would no longer be allowed to sell through its local App Store. Days later, Amazon.com’s cloud computing services unit in China told its customers that they, too, must remove any censorship-evading software that Beijing had deemed illegal. Apple explained its decision simply, saying it removes an app from sale in China if “it includes content that is illegal in China, which is not in compliance with the App Store Review Guidelines.” China recently tightened its regulations around VPNs and has used this to pressure global companies to crack down on them. Many Apple users and activists involved with internet freedom and freedom of expression accused the company of kowtowing to Beijing, implying that Apple had the moral duty to defy rules that aid and abet censorship and control. Even David Kaye, the U.N. special rapporteur on the promotion and protection of the right to freedom of opinion and expression, sent Apple Chief Executive Tim Cook a public letter querying the background on Apple’s move. Apple’s decision can be defended, however, on practical and economic grounds. On the practical side of internet freedom, there is a vital point: Removing the apps from the online store does not remove VPN capability from Apple gadgets in China, nor from iPhones that already have the apps installed, though it will make installing updates more complicated. Apple’s operating system allows users to set up VPN connections themselves without using an app. It is nowhere near as convenient and users need to have a way of paying a VPN provider directly instead of going through Apple. However, you can certainly argue that convenience, while important, is not a human right. On economic grounds, Apple’s duty to its shareholders means protecting China both as a huge and potentially even larger market and safeguarding the company’s extensive and vital manufacturing operations there. 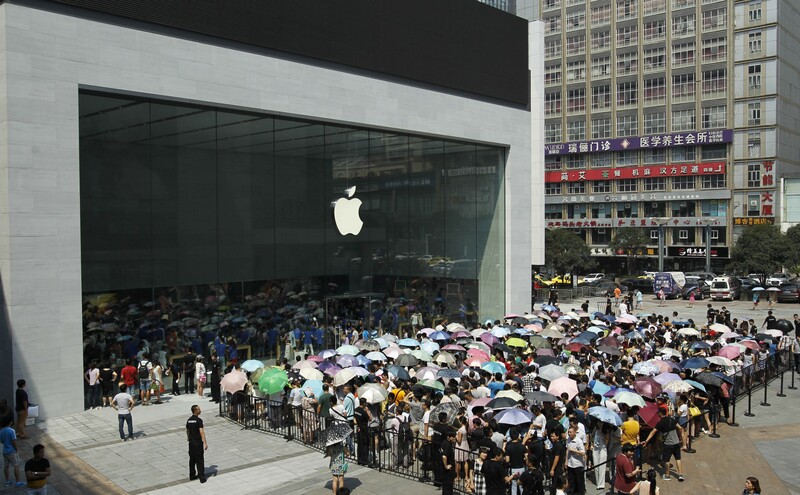 Punitive disruption to Apple’s access to the Chinese market would be bad, but could probably be overcome. Interruptions to its global supply chain could potentially be disastrous. Apple’s latest results, released Aug. 1, showed that China is currently the company’s third-largest market. Sales have been slipping however, so further erosion is probably not an acceptable option. The company also announced that it was setting up a data center in the southern province of Guangdong to comply with new government regulations about the storage of user information. And it appointed a new managing director for China who will report directly to Cook. These are all signs that the country remains too important to Apple for it to oppose government demands lightly. Some foreign companies look just to laws and regulations when drawing their red lines. Others draw or move their red lines when subtle pressure and threats get too great, even when there is not a piece of paper to back them up. China as a market has great leverage; China as a manufacturer has huge leverage. Google, which put “Don’t be evil” in its corporate code of conduct, stands out as an example of a company that paid the price for rejecting Chinese pressure. When it decided in 2010 that China’s censorship demands regarding its internet search engine were unacceptable, it refused to comply. Within months its services — search, maps, Gmail — were all cut off from the huge China market. They remain so today. Google turned its back on the potential for millions in advertising revenue and more importantly, it allowed a generation of Chinese netizens to grow up with no feeling for or loyalty to the company. Even if it some day is allowed back into China, the mountain for gaining meaningful market share is probably now impossible to climb. This was a real, harsh price to pay. So if there is a cost to your reputation for giving in to China, and cost to your business to defying it, where should a company like Apple draw the line? We have no idea what Apple’s board room discussions have been. I sincerely hope they have had them; this is far too important and consequential a decision to be made on the fly and under time pressure. But some issues clearly do push companies to the point where they should put their China businesses at risk, or even make the decision to withdraw completely. For Apple, perhaps the red line would be a request to offer a completely separate version of its operating system in China, one that does not allow any manual configuration of VPN connections, for example. Or the red line would be crossed if Beijing demanded the encryption keys to iCloud storage or messaging; or if Chinese state security demanded details about a particular individual, someone who had relied on an expectation of privacy. It is this last issue that created a major human rights and public relations crisis for Yahoo. In 2005, journalist Shi Tao was sentenced to 10 years’ imprisonment for “divulging state secrets” based partly on evidence provided by Yahoo that linked Shi’s computer and account to a posting on a foreign website about a confidential Communist Party directive on suppressing discussion of the 15th anniversary of the Tiananmen Square crackdown. Yahoo argued that it had had to bow to a legitimate legal demand. Critics maintained that international human rights norms meant the company should have resisted. In order to settle lawsuits in the U.S., Yahoo eventually pledged $17 million for a fund to help dissidents, a fund that itself was later ensnared in controversy, adding to the PR disaster. It is not easy doing business with China. There is always the danger of getting caught up in a larger governmental geopolitical squabble and the hazards that come from laws and regulations being tightened. There is the pressure that comes from China’s current icy ideological winds as President Xi Jinping prepares for this autumn’s Communist Party congress. And there are stark choices that come when certain assumptions about freedom of information and expression born in one system come crashing against another, very different system. David Schlesinger is managing director of Tripod Advisors, which advises companies on Chinese political risk, media and technology issues. He is the former chairman of Thomson Reuters China. In this “Business Insight” column, we track business activity in Asia, shedding light on changes and structural problems of the region’s economy, politics and society.